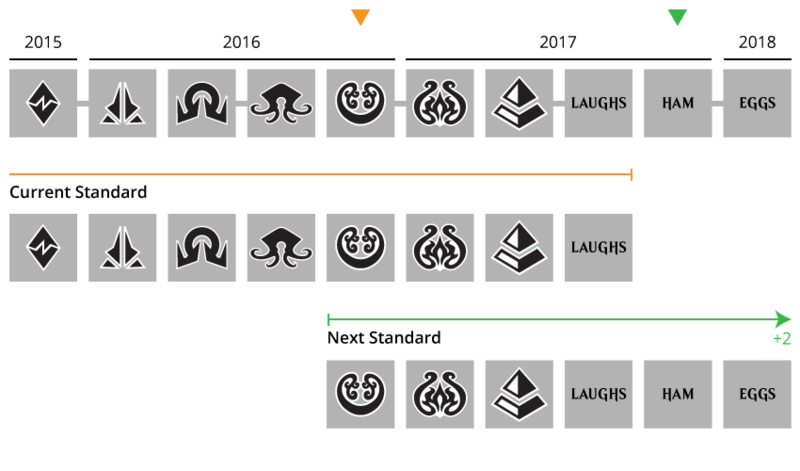 In case you missed it, we got a pretty big announcement from Wizards of the Coast today regarding the Standard rotation pattern. Just a year after being told that Standard would be switching to an twice per annum rotation schedule, Wizards has announced that they are switching us back over to a single fall rotation starting immediately. Essentially, every fall set will enjoy a full two years in Standard, with the next three sets released after it rotating out as a double block two Octobers later. For example, up until this announcement, we would have seen Battle for Zendikar and Oath of the Gatewatch rotate out with the release of Amonkhet in late April 2017, but now we’re back to the original system, where BFZ, Oath, SOI and EMN all rotate together with the release of the fall 2017 set. So what does this mean for us as players and Magic financiers? Well, as a player you get to play with any cards you buy from new sets for a few months longer that you were going to be able to, and it should lead to a reinvigorated Standard scene at your local LGS. On the other hand, the pressure is now on Wizards to make sure that Standard formats are complex and dynamic enough to stay fresh for longer, and individual cards getting banned if things get very stale are slightly more likely now than they were yesterday as a result. On the finance side, this is great news, as it means that Standard legal cards should revert to the older, predictable model of value appreciation and depreciation that we knew and loved since the mid 2000s. Specifically, look for rares and mythics from say, the fall 2017 block, to spike quickly at release, fall predictably until the fall of 2018 and then spike again based on the play patterns of that new Standard meta, only to collapse again in May/June of 2018 in anticipation of their rotation in fall 2019. Overall, this gives us more time on average (0 to 6 months depending on the set, since the second block of each year is still rotating on the same schedule, ie SOI/EMN still rotate out in fall 2017) to speculate without worrying about the need to dump cards if they don’t take off in their first year of play. This helps more with the first block of the year, than the second, so take note. With Masterpiece premium inserts still the norm for the foreseeable future, the expected value of your average rare or mythic in any given set will still be depressed, but they now have more time to take off in Standard and generate a spike. There’s only one reason that this change would be reversed before we even got to fully test it out. LGS participation and/or set sales were down, and my guess is both. Hasbro just announced in their investor update earlier this week that Magic: The Gathering revenues were slightly up for the year, so the inference is that supplemental sets were boosting overall sales, but that Standard sets were selling less product as players got gun shy about investing in cards whose rotation horizon always felts just around the corner. Hasbro/WoTC isn’t interested in letting revenues fall for obvious reasons, so I’d expect this change to stick for several years now that the experiment has failed. Instead, expect Wizards to double down on supplemental products and interesting new ways to increase the average revenue per Magic player over the next couple of years. From a speculation perspective, now would be a very good time to start looking at heavily played mythics and rares from BFZ/Oath that were depressed more than they should have been based on their looming rotation. 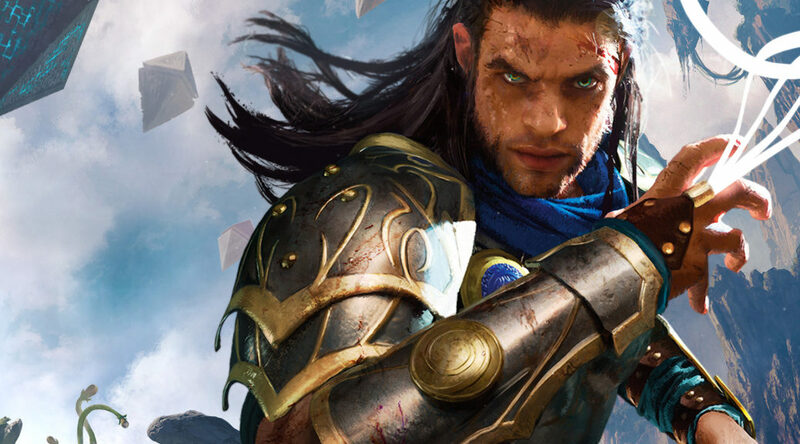 Gideon, Ally of Zendikar was one of the most played cards in the top 8 of Pro Tour Kaladesh last week, and as the most important planeswalker in Standard I’d expect him to make a dash for $30 based on this news. The staff will have further notes on this in forthcoming articles. Cheers! Can Gideon ride this change to $30+? The 800 dollars ktk standard decks in conjunction with twice yearly rotation was a big factor. My local LGS (in Berlin,Germany) switched all fnm’s to modern because there was no interest in Standard anymore. 40 ppl for modern and 3 for standard. James, you seem like a very nice guy and as I’ve said I love your coverage articles, BUT you should be banned from writing until you stop talking about Standard Cards getting BANNED. Why do you keep mentioning this??? How many years has it been since a Standard Card was banned…5 or so? I think more. Copter isn’t getting banned, Thoughtseize and Pack Rat weren’t banned, Siege Rhino wasn’t banned, Sphinx’s Rev, Thragtusk, Bonfire (which hit $50 at one point), baby Jace (hit $100), and COLLECTED COMPANY were NOT BANNED. So unless you have some inherent fear and just love to worry too much about things I truly don’t comprehend why you keep mentioning this. I otherwise love your writing and coverage, but you kinda sound ridiculous. I wouldn’t care as much if there were other writers on this site to follow but they all bounced and I’d like to stay loyal to mtgprice, but please stop sounding like the world is falling and Copter or Standard card X is going to get banned. Wizards realized they messed up with Thoughtseize and now these powerful cards are getting the Masterpiece treatment, or Conspiracy, Commander, MMA EMA reprints. Financially I don’t think they will ban a Standard card cause it would be too dramatic and financial loss for your general Standard and FNM player.